Tai Yuh Machine Enterprise Ltd. / Best Food & Pastry Machinery Co., Ltd. | Professional Food Processing Machine Manufacturer Since 1993. Tai Yuh was founded in 1993, is specialized in manufacture and design series of high quality and efficient food stuffing and forming machines, also the relative equipments. 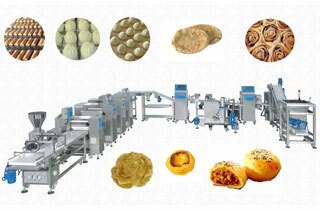 Tai Yuh Machine is a specialized manufacturer and exporter of food processing machines in Taiwan for 20 years. We do design, machine welding, assembling, electric power distribution, exporting and after-sales service by ourselves, we can control machine quality and delivery. We do R&D and machine improving constantly to meet more and more customers' request and sustainable management. Either you have a small shop or a family factory, you could use this machine to make steamed buns automatically. Shorten the length of machine extremely, still have the same functions and easy to operate.